Yes, we have been there and “observed” the FUNK – Jutebeutel vernissage a few weeks ago ;)Rolfe Schneider & company, Manuel Cortez, the Süß war Gestern crew, stil vor talent, blogger and journalists, art directors and creative workers, hipsters and no-hipsters, young and old, promoters and friends, DJs and economists… THEY HAD THEM ALL there, and of course, not to forget all these beautifully, partly hand-crafted JUTEBEUTEL, the typical trademark of Berliners.Here are some impressions, followed by Tobias Draheim’s exclusive interview for stylistberlin about DJing, FUNK and the upcoming fashionweek! I never got really warm with glasses. They horrified me. They used to disturb me while playing basketball or volleyball, they were uncool when young and they were too much revealing me being a … yes, a nerd. I do wear them for over a decade now. I used to wear them at home, at the library, at the small cabinets of the so called study rooms (Korea is a funny country) and when I was with my closest friends. Oh, and when I rammed my thumbnail into my right eye whilst removing contact lenses……. duh. Finally, my favourite one broke and two old 0815-models were left. So, after hitting the ic!Berlin store, I paid FUNK store a visit – also just around the corner (yeah, I admit I never get out of the kiez) – and was very surprised by the huge numbers of styles they had and above all – the best service I have ever experienced at an optician! First of all, the chairs in front of the store invite you to sit down and have a chat or a cigarette. The crew is fabulously friendly and specialists in what they do (when I was at Karl-Liebknecht-Straße, at another shop, a girl had problems adjusting the ic!Berlin glasses for me… Not very professional). FUNK have frames for every, literally every taste and nose and face and the adequate lenses (and I am really picky when it gets to glasses!) They welcome every customer with a smile and are at your hand to consult you with everything around glasses, sunglasses and lenses. That’s what I call service. I am really happy to have finally met mash-up legend Tobias “Shokkaboy” Draheim, who started to work at FUNK recently. Here it goes, exclusively for stylistberlin: the interview! stylistberlin: Tobi, if you would describe yourself in just three words? stylistberlin: Your soundtrack of your life currently? Shokkaboy: Definetly Robosonics Punchi Punchi Mix Tape. stylistberlin: The biggest influence on you, becoming a DJ? I really can’t remember. Just my love to and my inability to dance. I still remember being the DJ for my classmates in 3rd or 4th grade. A double Cassetteplayer and a Walkman (yeah i had family in West Berlin sending me nice stuff) was the setup for my first DJ Gig. stylistberlin: You’ve had quite a name in Berlin’s mashup scene. Why did you take a break? Well it was! Nothing you could make a living of in Berlins music scene and people didn’t understand a set of electro tunes when you’re anounced as a MashUp DJ. 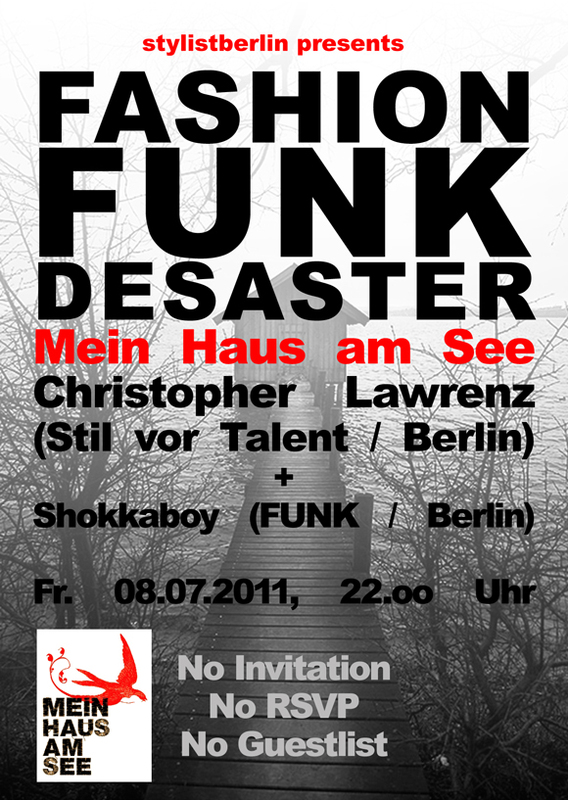 stylistberlin: You are playing a back to back set with with Christopher Lawrenz (stil vor talent) soon. How come? Chrissy is one of the artists we support. When he saw me play a couple of weeks ago (he thought i was just talking crap, when i told him i was a DJ :) ) we decided to play together some. „Mein Haus am See“ it is now on the 8th of July. stylistberlin: You took a turn in your career and now, FUNKstore can’t be imagined without you. Please tell us a bit about the store concept and the customers so far. I see the FUNKstore, like the brand „FUNK“ itself, more as a lifestyle then just an optician. A place to hang around. Most of customers are people, coming to our store because other happy customers told them to. Take a look at Sacha from Robosonic. We found a realy nice frame for him, suiting him perfectily and he is telling everyone to check the store if they need glasses. stylistberlin: You organized quite a huge Vernissage with loads of people at your new homebase, FUNKstore Berlin. Tell us more about it. It was meant to be a little exhibition, organized by one of my colleagues and his friend. The last two weeks before it became a „out of control“, because it seemed that we hit a nerve with this little „Jutebeutel“ thingy. In the end it was a perfect party with old and new friends and customers. stylistberlin: What is so special about the shop? The frames, of course. And the treament you get. stylistberlin: Any events from FUNKstore to keep an eye on? I’ll let you know. Have to finish the MBFW first. stylistberlin: Define happiness for us, please. Surrounded by people who sharing the passion for crazy ideas and a lot of good music.
. Live where (district), reason for chosing the place: Bötzowviertel; since 1979 with a little 16 year break.